​In just fifty years, a poor fishing village turned into a booming metropolis that outshines the rest of the world. In just fifty years, a poor fishing village turned into a booming metropolis that outshines the rest of the world. What’s the secret behind the Singapore miracle – and can it be cloned? Journalist Reetta Räty took a ride on the city-state’s metro to find out. Tiong Bahru metro station epitomizes much of the rest of Singapore: clean to the point of sterile, clearly signposted, crowded – and growing by the day. Notices about the construction of a new shopping center for the station are childishly gushing: Tiong Bahru Plaza – Energizing Heart & Soul! For leasing opportunities, please contact us! Towards a more flourishing Singapore! Information about the extension is available in four languages on the construction site walls; Tamil, Malay, English, and Chinese. Down in the metro tunnels, the multitude of signposts continues: smoking forbidden; explosives forbidden; eating and drinking forbidden; carrying odorous durian fruit forbidden. Explosives would land you the biggest penalty, but even eating would result in a hefty fine of 500 Singapore Dollars, i.e. about EUR 310. Diverse, is the first thought that comes to mind – Chinese, Muslim, Indian, Western expats. Construction workers and business people, school kids and elderly people. A metro journey gives you Singapore in a nutshell. The city-state that is currently celebrating its 50th anniversary is multicultural but harmonious, self-aware but obedient. The total opposite to its humble beginnings as a fishing village fifty years ago, when it was ousted from Malaysia, quarrelsome, and poor. How did this happen? We set off to find an explanation to the Singapore miracle. The distance to the other end of Singapore is just 40 kilometers, so we may as well do our exploration from the comforts of a metro. Leonard C. Sebastian is a professor at the S. Rajaratnam School of International Studies at Nanyang Technological University. He is standing in front of a window at Swisshotel congress center, offering dazzling views over Marina Bay Center’s three towering skyscrapers with a boat-shaped building nestled in between. The famous infinity pool, palm trees, and casino are tucked away in the heights in the distance. A river runs through the Marina Bay shopping center, beckoning for a little boat journey to spot Armani, Boss, Chanel, Fendi, Givenchy, Gucci, Burberry, Porsche Design, and the list continues. A futuristic cube floating on the water is a Louis Vuitton store. It all feels very over-the-top and artificial. Leonard C. Sebastian was brought up in Singapore. As a child, the country was a modest piece of land neighboring Malaysia, close to the equator. It was home to fishermen and farmers, with small villages dotted around the island. Singapore became independent exactly fifty years ago in 1965, and the rest is history. At purchasing power parity, Singapore has the third-highest GDP per capita in the world at EUR 74,000, and the unemployment rate is close to zero. Professor Sebastian promises to outline some background to Singapore’s success story. Right from the start, Singapore was a type of Asian take on the Suez Canal. It became the perfect port of call for Europeans on their way to Japan and other parts of Asia. Also the airport became a sanctuary for Japanese and Western business people catching their connecting flights to Indonesia or Australia. Soon, the transit stop became a final destination. “It was made a convenient place for dealing with the Southeast Asian market,” Leonard C. Sebastian explains. Singapore’s geographical position has influenced its development in other ways, too. “We’re surrounded by Muslim countries”, mentions one local after the next, when asked about the miracle economy. But how does this affect the economy? My random street panel explains that a country that’s under potential threat on every side needs to be militarily prepared. A two-year national service is compulsory for men in Singapore. This year, about EUR 9 billion was allocated to national defense. An external threat – or at least the idea of it – has kept the nation united. And spending on the latest fads for the armed, air, and naval forces requires a whole lot of money. In Singapore’s case, economy is closely tied to politics. The country believes in the market economy and meritocracy. Or to be more precise: throughout history, Singapore has fervently believed in the market economy, meritocracy, and the world at large in the footsteps of former long-term Prime Minister Lee Kuan Yew aka LKY. Lee Kuan Yew passed away in the spring, but his legacy lives on. The “most competent and talented” are elected as leaders, often getting paid millions each year. “The concern is that otherwise the best people will work for the private sector, as surgeons or lawyers, for example”, Leonard C. Sebastian clarifies. “It’s easy to do business in Singapore: people speak English, taxes are low, the system is predictable, corruption non-existent”, professor Sebastian lists. The World Bank has ranked Singapore the best country to do business. In 2014, foreign direct investment (FDI) flows into Singapore reached EUR 72.5 billion. In other words, FDI are on par with Brazil. This is not a coincidence, but a result of systematic planning. The hotel window offers views over Singapore River – a bridge in the distance is now a section of the F1 track, and a former customs house on the shoreline has been revamped into a fancy oyster restaurant. A huge port with its cranes and containers can be glimpsed further in the distance. The view depicts Singapore’s story: its geographical location and determined political decision-making have made it an international trade hub, attracting both a flow of goods and money. But there are more special features that help understand the rapid advancement, which have nothing to do with containers or banknotes. It’s about people. Along the next stops on our metro journey, we get to see how people view the language, housing policy, and ethnic groups. The Tanjong Pagar station is located on the green metro line. At the time of its inauguration in 1987, Singapore was the second country in Asia with a metro service. 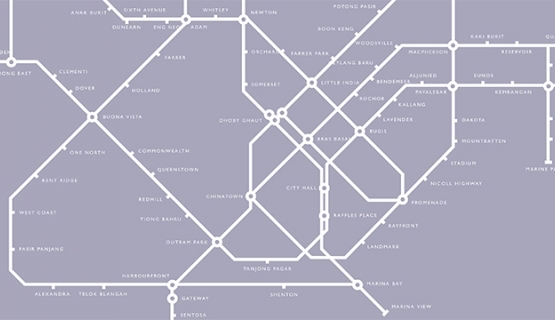 Today, as many as 3 million people take the metro each day, lines traversing a total of 160 kilometers. Opting for the left side when driving, walking, and taking the escalator is a remnant from the time of British colonial rule. With a total of 5.6 million residents, Singapore is the second most densely populated city in the world after Macao. Even Hong Kong has more space. But metro stations don’t seem overcrowded and the streets don’t smell of trash. People can be described as tidy and well-behaved, yet diverse. A Chinese Methodist church that holds services in English and Hokkien, one of the many Chinese dialects. The construction site of a 38-story office block with constuction workers from Singapore, India, and Bangladesh. Amoy Street Food Center, offering Malaysian, Chinese, Indian, and Korean street food. Al-Abrar mosque, with a group of Muslims knelt down to pray on the men’s side. Thian Hock Keng temple, with “Tao is universal” inscribed in front of the altar. Sri Thendayuthapani Hindu Temple, where bare-footed people in Indian clothing circle around, as drums are beating, fires are burning, and the fragrance of incense fills the air. In this neighborhood, people have a variety of mother tongues and believe in different gods. This is a typical characteristic over here: despite diverse backgrounds, first and foremost people are Singaporean. The temples of four different faiths are located in Telok Ayer, which is no exception. Along Waterloo Street, you will find a Jewish, Catholic, Buddhist, and Hindu place of service all situated close together. Most Singaporeans have Chinese origins, followed by Malaysian. One in ten people come from India. At the time of its independence, Singapore’s father Lee Kuan Yew saw the diversity as a potential threat to the nation’s coherence. In order for Singapore to become a financial marvel and defend itself against neighbors, there was no room for mutual conflict. As a result, multi-racial harmony thinking has been practiced systematically. This thinking is particularly evident in the language. The language of education is English, which is nobody’s “own” language. Lee Kuan Yew considered this to be both fair and useful. Especially those with Chinese as a mother tongue were set to be future stars: they would be fluent in both Chinese and English. Racial harmony is promoted both through stricter legislative measures and through a softer approach - upbringing. Equality between all ethnic groups, which in Singapore are referred to as “races”, is drilled into children already in kindergarten. Racial harmony theme days and festivities of each faith are celebrated in schools. In addition, approximately 1.3 million foreigners live in the city. About half are foreign workers, such as builders, cleaners, nurses, service staff, cooks, and child-minders. “Jobs that Singaporeans don’t want to do”, Singaporeans explain. The remaining share of about 600,000 foreigners are expats in upper middle class professions. The Science Park can’t be reached by metro, so let’s hop in a taxi from Holland Village MRT Station. Science Park is an area of 350 corporate offices, offering work to over 9,000 people. At 1 pm, people are returning to their desks from their lunch break. As always it’s hot and humid outside, with temperatures hovering at 30°C year round. But inside the Teletech Park building it’s freezing cold. One of the makers of Singapore’s economic miracle – an entrepreneur from abroad – sits on a sofa in the office building. Or maybe it’s more a case of having been lured over by the miracle? Finnish businessman Thomas Zilliacus is the Executive Chairman of YuuZoo, a global social e-commerce company specializing in virtual shopping centers. Zilliacus is also involved in twenty or so other companies. In 1993, Zilliacus resigned from Nokia, but soon returned to Singapore. Singapore’s small size coupled with its population growth means that house prices are on the rise. The monthly rent for a stylish, two-bedroom apartment in downtown Singapore is over EUR 6,000. Despite Finland’s notoriously high vehicle taxation, also cars are much more expensive in Singapore. Yet people keep coming. In spring 2015, the BBC published an article that described Singapore as an “expat utopia”. You can even drink the tap water! Zilliacus remembers a time when Singapore welcomed foreigners with open arms. Now the criteria have been changed, and the requirements for a work permit are rigorous. The idea is to protect Singaporeans from unemployment and curb the rise in house prices. According to government calculations, Singapore has room for just under 7 million people. Zilliacus reflects on what would happen, if expats wouldn’t get in as easily as until now. Zilliacus agrees with the stereotype that employees educated in Singapore are hardworking and dedicated, but lack initiative. The education system has a lot in common with schools in China: hard work, lots of memorizing, ranking lists. In the West, those who have difficulties at school are given extra teaching. In Asia it’s the other way round: tutors are hired to make top students excel even further. They say that the system produces hardworking employees who aren’t very innovative. “Sometimes I have to ask employees, who have responsibility and a pay check to match, whether they could just think about alternatives or solutions themselves. If this is the problem, what do you think is the solution?” Zilliacus explains. But this isn’t the whole truth. Asia is enormous, and of course also creativity and multitalented superstars abound. “Already now more innovation is generated in China than in Silicon Valley”, Zilliacus claims. Zilliacus has spent nearly 30 years in Singapore. He has witnessed a striking transformation, and, like many others, wonders what’s next. The death of Lee Kuan Yew, who built Singapore, was a significant moment symbolically, although the country has officially been in the hands of his son Lee Hsien Loong since 2004. So far, the city-state has had a clear vision: from poverty to one of the wealthiest, from a third-world to a first-world country. “Now the country has accumulated so much wealth that risk-taking has decreased”, says Zilliacus. In addition to a lack of innovation, over-cautiousness – a standstill – may turn out to be Singapore’s downfall. Maserati, Ferrari, a six-series BMW. Mercedes, Land Rover, Porsche, Lexus. A shopping center with a tunnel that leads to four more. Cars are fancier than in Western cities, and the stores are the same as everywhere. Let’s jump into an elevator and press number five. Here we see why both groups of foreigners in Singapore – expats and foreign workers – are so happy here. If you have money, it’s cheap and easy to employ a maid to take care of cooking, cleaning, and childminding. And if you don’t have money, it’s easy to get a job and a place to live, as maids live with families. Along the corridors, there are dozens of agencies that match potential families with maids mainly from the Philippines and Indonesia. Competition among the agencies is in full swing: unlimited Wi-Fi, lunch buffet, special gift, no registration fee! Women flood from the elevators with their entire earthly possessions stashed inside a pull-along suitcase. You need a maid sir? Are you looking for a babysitter, mam? As many as six job interviews are going on in one of the rooms. A Western father carrying his child in a baby carrier fires questions: What nationalities have you worked for before? Can you iron? Do you have kids of your own? Can you cook Western food? The maids tell me they earn EUR 300-500 each month. Singapore clearly tops the world when it comes to highest income – and the most extreme income inequality. Despite this, the city-state may be a dream place also for those with lower incomes. It depends what you compare it with. Shirley, who works as a maid, arrived in Singapore from the Philippines in 1986, leaving behind her three children. Her youngest child was just a year and eight months at the time. When she left, the whole family cried. As a child, Shirley would walk to school in bare feet. Her family lived on sweet potato, because rice was too expensive. Shirley would stare at those who could afford sandals and proper food. She decided that her children wouldn’t end up in her predicament. “Despite the tough sacrifices, it’s been worth it,” she thinks. Shirley is a maid, gardener, cleaner, childminder, anything her employers wish. She sends a portion of each salary back home. “I’ve achieved all my dreams,” she says, looking intently in the eye. All of her children now have a university education, and Shirley was also able to help her parents and aunty during their lifetime. What does Shirley plan to do now that her dreams have come true? Will she return home? “My home is here now,” she says. She has had the opportunity to travel along with her employers to Canada, Europe, and Pacific Islands. But she prefers Singapore: it’s clean, safe, and offers “good shopping”. Her children live in the Philippines, which she finds noisy and dirty. In Singapore, she has her friends, home, and the Catholic Church, which she visits every Sunday. Every metro station offers a similar view: a cluster of high-rises known as HDB housing coordinated by the Housing and Development Board. Their construction was what spurred Singapore’s transformation from a developing country to a modern metropolis. This fall, Singapore’s red-and-white flags will be hanging from the balconies of the buildings. During the summer, the state sent each home a “fun pack” to mark Singapore’s 50th anniversary, including a flag. Fifty years ago, also this area was rather different: farms, cows, pigs, and a village of shacks without guttering. Then construction began, and the shacks were bulldozed to make way for new buildings. Already during the first year, in the 1960s, HDB commissioned 55,000 apartments for local people. Now most of the population, roughly 80 per cent, either rents or buys property from the state. This ensures reasonably priced homes. Quotas are in place to prevent the formation of cliques among minorities. According to Singaporean Maevis Lee, a 100 square-meter HDB apartment now carries a price tag of around EUR 170,000–430,000 depending on location. “People often put their names down on the waiting list already years before something comes up,” she says. Maevis herself lives in an HDB apartment with her husband, father, and 8-year-old daughter. It’s common in Singapore for parents to live together with their grownup children. The lower floors of the Redhill apartment blocks house communal spaces for residents. Even the food stalls at Hawker Center, an outdoor food court nearby, have quotas: stalls reserved for Chinese, Malaysian, and Indian food. Despite its Chinatown, Arab Street, and Little India, people don’t flock to live in the areas according to their heritage. They are simply places for picking up clothes, ornaments, or festive foods for celebrations like the Muslim Eid holiday and Chinese New Year. The Queenstown district was Singapore’s first suburb of apartment blocks. Earlier on, it was a country village populated by Hokkien- and Teochew-speaking farmers. Walking in the shadow of the HDB buildings, you can’t help think that Singapore feels like a laboratory. Like a utopia made real. One-of-a-kind social micro conditions were created for the island, and a societal experiment led by Mr. Lee Kuan Yew began. On a financial scale, the answer is yes. When LKY passed away, The Sunday Times published a supplement with a section entitled “He changed my life”, voicing how ordinary Singaporeans felt Mr. Lee had changed their lives. But the price was paid at the expense of individual rights and freedom, as Mr. Lee decided what was good for his people on their behalf. What to do after relative wealth has been achieved? Was the fruit of labor distributed fairly after all? What is the next aim? Singapore is often compared to China, but this doesn’t quite work. Unlike many other Asian societal experiments, Singapore has kept its doors open to the outside world. And unlike communist party leaders, LKY generously explained his political views during his lifetime. (His explanations were roughly along the lines of: “This is Singapore’s model, because it’s the best model.”) And of course, elections are held in Singapore. But today, the conditions in the lab aren’t quite as stable as in the early 2000s. So far, people have mainly been coming in. Now the doors also fling out; Singaporeans travel and study abroad, social media is buzzing, bloggers criticize those heading the lab, and opposition is perhaps fragmented but bigger than before. Even the residents of these apartment blocks used to live according to the rules of a set system, but now there are options. Accompanied by two young Singaporean women, we cross the Padang field, where Jubilee celebration constructions are in the process of being dismantled. It’s Sunday, and hundreds of women from Myanmar are enjoying a picnic in a nearby park - maids and cleaners making the most of their official day off. You often hear people refer to Singapore as merely a shell, lacking history, cultural heritage, and critical intelligentsia. “A chilling place,” comments a Finnish engineer based on his experiences during a study exchange year in the country: learning off by heart, lots of work, not much fun, loads of bans. “Disney World with a death penalty,” the country’s main newspaper The Straits Times remarked in one of its book editions. People love to remind about the no chewing gum policy, which both those who love and loath Singapore find tedious. Can’t they think of anything else but the gum? Recently, a journalist of the local Business Times wrote poignantly about Singapore being “antiseptic”, although it should be unique and have plenty of character to please the West. Aren’t the GDP growth, low crime rate, and top-notch health care enough? Should there also be a bit of grunge – like toilets out of order – to make Westerners feel superior even in Singapore? Some are upset by the power of the system, lack of freedom of speech, and the patronizing stance of government leaders towards citizens. Instead of meritocracy, the talk is about nepotism, and people don’t think the elections will have an impact on decision-making. Others are satisfied that crime, poverty, and shabbiness have been cleansed from the streets, even if under the threat of punishment. Would someone really want to go back to the old: dirty and smelly shacks, hunger, under threat by neighboring countries? Hotel Shangri-La is like a palace. The faint sound of classical music can be heard in the background, as people stretch their legs and are engrossed in their mobile phones on the lobby sofas. A host of service staff attends to the flood of taxis outside: Welcome, madam! Welcome, sir! Can the Singapore model be cloned? Poor countries wanting to get richer and wealthy countries with a public economy in dire straits are eager to learn Singapore’s secret. Singapore gets mentioned especially when talking about the need to enhance health care and the pension system. The country’s health care expenditure is about 4 per cent of GDP compared to Finland’s equivalent figure of 9. Singapore is able to produce the world’s best health care services with proportionally less money. Then there’s the unemployment rate: close to zero. We make ourselves comfortable on the lobby sofas. Yeo Lay Hwee, can Singapore’s success story be copied? Hwee responds by asking whether I’d watched Prime Minister Lee Hsien Loong’s speech the night before. Yes, I sure did. The speech has been quoted in detail by the press and on Twitter. According to Yeo Lay Hween, the prime minister’s speech outlined the fundamental assumptions that Singapore has been built on. Yeo Lay Hwee describes the idea of human nature that underpins the Singapore model. Thirdly: Trust between people and the government. Do e.g. Western countries share these basic statements? From the viewpoint of liberal democracy, it’s difficult to even begin to answer the question, as values and basic statements vary in each country. In Western democracies, politics is based on a battle between different views on humanity. The values that push through are the result of elections, rather than predetermined in the heads of the nations “wisest”. So far, a single truth has been upheld in Singapore, as the same party has remained in power throughout its entire fifty-year history. When LKY, the father of the Singapore model, was asked what he thought about the growth of opposition, he said it doesn’t matter who leads the country - wise people will reach the same conclusion he had in any case. This is almost the total opposite to an idea of politics being about searching and offering alternatives, continuous negotiations, and balancing between differing opinions. Elections were held in Singapore in September. People’s Action Party, PAP, continues to hold nearly all political power in its hands. Despite its staunch critics, many experts are of the opinion that opposition has failed to come up with a convincing enough alternative. I chat with Yeo Lay Hwee about the young generation, coined as the Strawberry Generation over here. Wealth is a given to them, and they haven’t had to lift a finger to do chores around the house, as there’s always a maid around. Is the promise of constant wealth accumulation enough for the Strawberry Generation, or will it be demanding more political rights? Yeo Lay Hwee believes that if the values of the young differ from the values of those in power, the Strawberry Generation will create another type of society. Why couldn’t Singapore change like any other country: gradually. Young people have more options and demands than Hwee’s generation did in its time. They have the opportunity to work in interesting startups, and especially the highly educated aren’t so gullible to a one-sided truth. “Perhaps they’ll learn to work smart instead of work hard,” says Yeo Lay Hwee. She herself grew up in a shop house along Singapore River. The houses have now been conserved as bars and boutiques that look like cute dollhouses next to towering high-rises. It’s been a tremendous change. Yeo Lay Hwee’s parents didn’t learn to read and didn’t go to school. The family of five children lived together with relatives and three other families, twenty people sharing the same bathroom and kitchen. Born in the 1960s, Yeo Lay Hwee received a public education, which was virtually free. Both he and one of his brothers went as far as university. They became part of the Singapore miracle: poverty was conquered through education. It’s been a long journey to this serene afternoon in the Shangri-La. Next to the metro station entrance, there’s a small park with a star-shaped sculpture: the Progress Star, which is accompanied by the following sign: There was a time when people said that Singapore won’t make it, but we did. A woman in high heels asks for her picture to be taken in front of the star. “Make sure the iPad under my arm is visible”, she says. Also a wedding party is being photographed in the park. 23-year-old Singaporean Jalel explains that the wedding couple met near the Sultan mosque on Arab Street and got married yesterday. Jalel himself has just graduated from one of the polytechnics in Singapore. He would like to work at the port, maybe as a navy officer. “But you know, right now I plan to enjoy life and take it easy”, he adds. Nazri, who works as head of design at a photography agency, regroups the bride and groom for their picture to be taken on a swing. The twenty-somethings laugh and bicker playfully, as they pose for the camera. They are the ones who hold the destiny of Singapore in their hands for the next 50 years. I think about the female students I chatted to earlier in the day, who were eager to work in tourism. Definitely nothing to do with statistics that would match their qualifications. Then there was the mother, who said she always voted for opposition – not because she was really against the ruling party PAP, but to resist its absolute power. And that woman in her 30s, who was forced to quit school when her father took ill, and Singapore’s much-praised health care model doesn’t really work for those doing odd jobs. I think about the American businessman, who had spent twelve years in Singapore, saying that modern Singapore is a tough cookie for government, but better than ever for residents: there are now alternatives, you can disagree, there’s more freedom. I think about LKY’s interview book featuring journalists from Singapore Straits firing questions to the father of the land on politics, family, wars, gay people, foreign powers. A picture begins to form of an extreme ideology shrouded under the veil of extreme pragmatism. More pictures, same theme: Me and the Progress Star. It’s no wonder people are eager to copy the Singapore miracle. It is, after all, an incredible country. But copying is unlikely to work. It’s hard to imagine Western democracies succumbing to harsh discipline and authoritarian government, which are the hallmarks of Singapore’s success. Also the character of a city-state differs from bigger countries: there’s no rural population, long distances, or an emptying countryside here. Singapore is man-made. Even a large slice of its surface area was created artificially. Is the Singapore model still relevant even for Singaporeans themselves? At the beginning of my journey around the city, Leonard C. Sebastian explained the secrets behind Singapore’s success: geography, economy, meritocracy, multi-racial harmony, language, and housing policy. He also said that Singaporeans had paid a high price for their wealth. An authoritarian model works up to a certain point, but these days people want more from life than food and a place to live. But now people ask: what about social justice, equality, and freedom of speech? In 2015, Singapore was ranked 153rd out of 175 nations in the Worldwide Press Freedom Index by Reporters Without Borders. Yet a major revolution is still not in sight. “Who would fire the CEO, if the company’s making a huge profit?” asks Leonard C. Sebastian, revealing a great deal about Singapore at the same time. The country is led like a company. It’s like a successful startup: a self-developed concept of a functional society, highly-educated workforce, and plush office. So far, the company has been helmed by its founder, but now employees are ready to take on some of the product development responsibility. I take the escalator down to the metro. Singapore was built in a tropical rainforest, but the metro tunnel is lovely and cool. Aalto EE has a campus in Singapore where our Singapore-based programs have their home base. Economist Intelligence Unit 2015; BBC; Singapore government statistics 2014; expatarrivals.com; Singapore Ministry of Manpower; The Sunday Times (Mr Lee Kuan Yew Special, 29 March 2015); Lee Kuan Yew: Hard Truths to Keep Singapore Going, published in 2011 by Straits Times Press. Also Paula Parviainen, Finland’s Ambassador to Singapore, and Teppo Turkki, leading expert on East Asia at Tekes – the Finnish Funding Agency for Innovation, were interviewed for the article.